If you are looking for homes for sale in Sun Lakes AZ you are most likely interested in the Sun Lakes AZ market trends report. We have compiled the Sun Lakes market report for July 2015. Home values were up over the same period last year by 3.75%. Sun Lakes Arizona is an active adult Robson developed community in the East Valley of the Phoenix area bordering Chandler. Sun Lakes is comprised of five separate communities, each with their own resort amenities. 35 single family and villa homes were sold during the month of July 2015. The average price of homes sold was $245,301 or $131.01 per square foot. 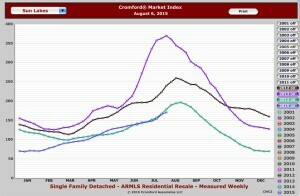 Average days on the market was 90 and sales to list price ratio is .96. The lowest price home sold was $120,000 and the highest was $384,120. Home values are up significantly over the past few years as you can see from the chart on the left and that is good news for sellers who have been waiting for home values to rise. With low summer inventory sellers are seeing quicker home sales this summer as buyer activity remains consistent. 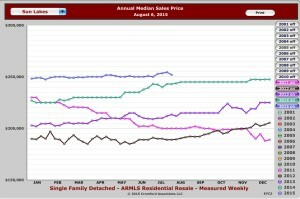 The annual median sales price in the chart for 2015 is currently at $252,000 compared to last year when it was $243,000 resulting in a 3.75% increase. 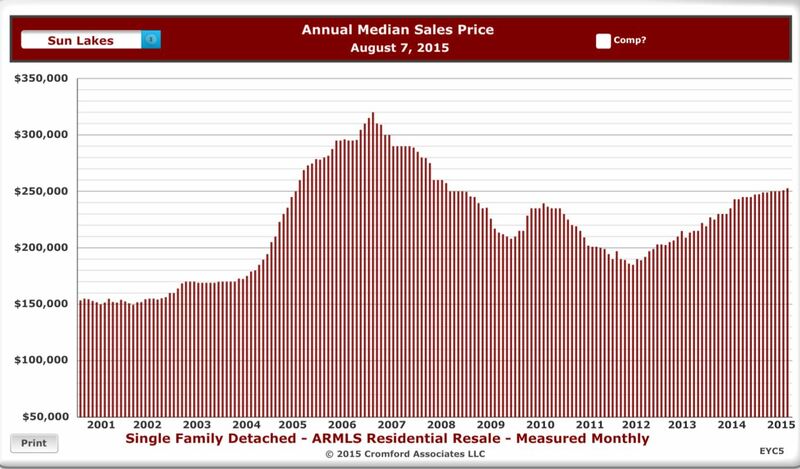 This chart will illustrate annual median sales prices over a ten year period. You will see the peak in 2006 before the big downward slide. Sun Lakes had a short term rise in prices in 2010 before bottoming out in 2011-2012 and prices have risen each year since. 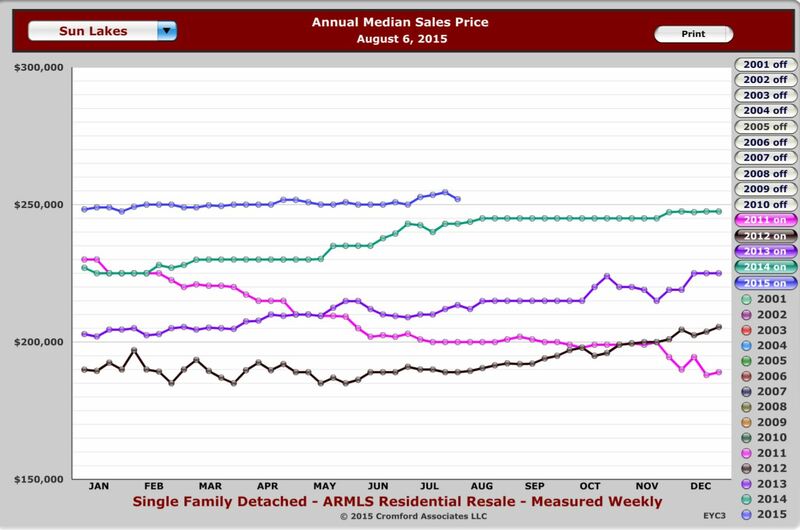 The current annual median sales price is $252,000. Hopefully the trend continues. This chart is for all of Sun Lakes which includes five separate communities. For information one of the specific communities call us at 480-440-0849 or email becky@mysunlakeshomes.com and we will be happy to provide that information. 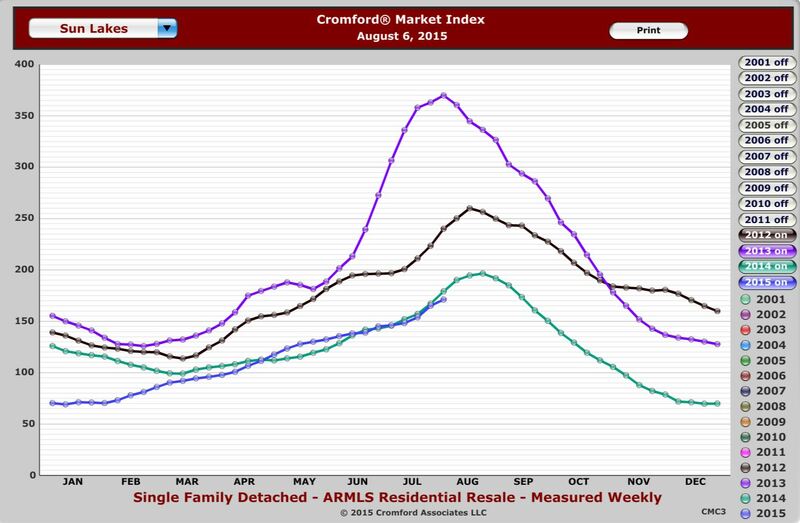 The Cromford Index is a resource of Cromford Associates, LLC that measures and tracks real estate in the entire Valley on a daily basis. An index of 100 represents a balanced market – neither buyer or seller advantage. As you can see from this chart in 2013 when the index was 369 it was a hot seller’s market. Currently the index is at 171.2 compared to 179.2 last year at this time. We are seeing buyers continue to make offers even throughout the summer. The issue for them is that there is little inventory from which to choose. All signs are pointing to a strong selling season, which officially kicks off in the fall and builds during the winter months. Historically, sales have been virtually nonexistent in the summer, but we are seeing an opposite trend the past few years. Whether you are considering buying or selling the time is right. 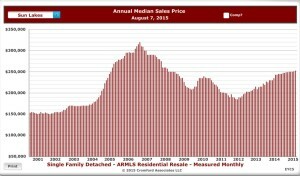 Prices are rising, but modestly. As you can see, prices have continued to rise the past few years, but we are still well below home values before the market crashed. We can help you accurately price your home to sell and we can help buyers establish the correct value on a home purchase. Many factors go into valuing a home including floor plan, location, condition and other criteria. 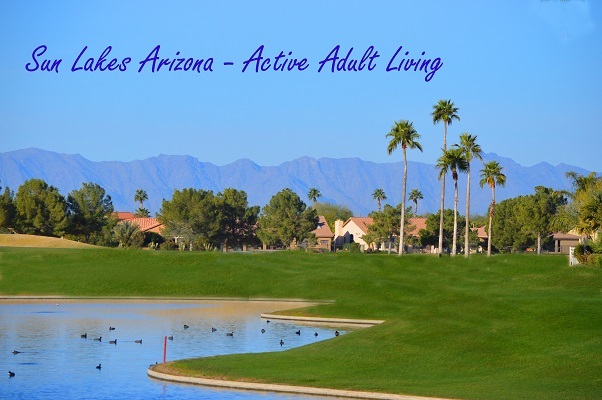 If you are considering making Sun Lakes AZ your home call us at 480-440-0849 or simply fill out the short form below and we will contact you! It’s that simple.